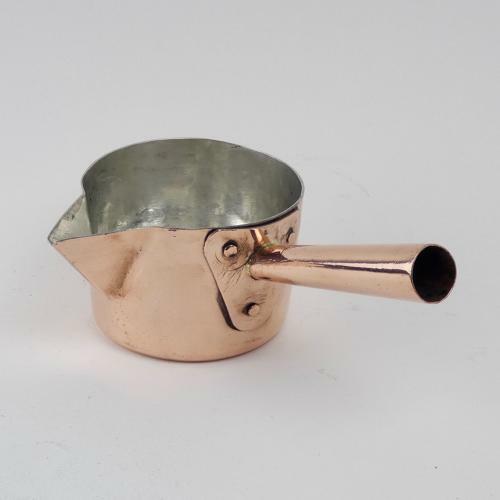 A small, 19th century copper saucepan with a hollow copper handle and a pouring spout. This piece is well made, from a heavy gauge of copper, and it dates from c.1880. The hollow handle allows the heat to disperse so that it is a little easier to handle. It is in excellent condition and the interior has been re-tinned so that it can be used. The pan is 10.2cm. diameter by 13.5cm. wide across the spout by 7.5cm. deep and the overall length of the pan, with the handle, is 20.5cm.